We all know shaping up is no easy feat. Yet, it’s important for you to keep going. If you want to live a healthier life, you need to keep those pounds off which means taking your post-workout meal and snack seriously. Your diet is a major part of your fitness regime and if you are not doing it right, all your hard work at the gym goes down the drain! Going on a diet is a difficult road, but it can make all the difference in the quality of your life and your overall wellbeing! You need to know what is right for your body when you finish your exercise. After sweating it out, specific nutrients in your body need to be replenished to stabilize the blood sugar and repair your muscles. This can help you rev up your metabolism and improve recovery. Here are five foods you can have in the form of meals after your workout that will keep you fit and healthy while making sure you replenish all the essential nutrients you have consumed. During the workout, your body loses carbs to generate energy and power up your muscles. Having a turkey wrap that is rich in fiber and vegetables can help you refuel your carb levels simultaneously normalizing the blood sugar levels. This results in you feeling revitalized instead of exhausted. More importantly, it prevents you from overeating. With the turkey providing the protein content, your muscles will recover a lot quicker. Having proteins after a workout, can help rebuild and repair muscles faster and boost metabolism. Have no time for a full meal after your run? Then all you got to do is ziplock these protein and fat-rich snacks and you are good to go! Nuts are an excellent reserve of healthy fats and proteins. They will also help you keep your hunger pangs at bay while you are busy exercising. Oranges, on the other hand, provide you with carbs and are rich in vitamin C that helps boost the immune system. Having these nutritious snacks on the go is the best way to refuel the vitamins and minerals your body has utilized during exercise. Whip up a quick avocado and berry smoothie spiked with some protein powder to get you going. Smoothies are the ideal post-workout treat. Throwing in some avocados will not only give a smooth, creamy texture to your shake but will also keep you fuller for longer while you go about your day. 23% people that incorporated avocados in their lunches felt fuller and satisfied for longer periods of time than those who didn’t have it. The fats in avocados are useful in repairing and supporting your joints, keeping you light on the toes and risk-free of joint injuries while you are sweating it out box jumping. An even better way to have your avocado smoothie is to throw in some anti-oxidizing frozen berries and a heap of that protein powder that you love. You can also try Greek yogurt as an alternative to protein powder. For every cup of it, you will get 22 grams of protein. Salmon is the best source of omega-3 healthy fats which decrease the after effects of workout including muscle inflammation. More interestingly, this fat can help cut down unhealthy fats in your body by boosting fat burn. Adding a delicious mix of celery, grapes and olive oil can turn your tedious chopped salmon salad into a healthier salad. The celery and grapes add carbs and fiber content while the olive oil infuses healthy fats. 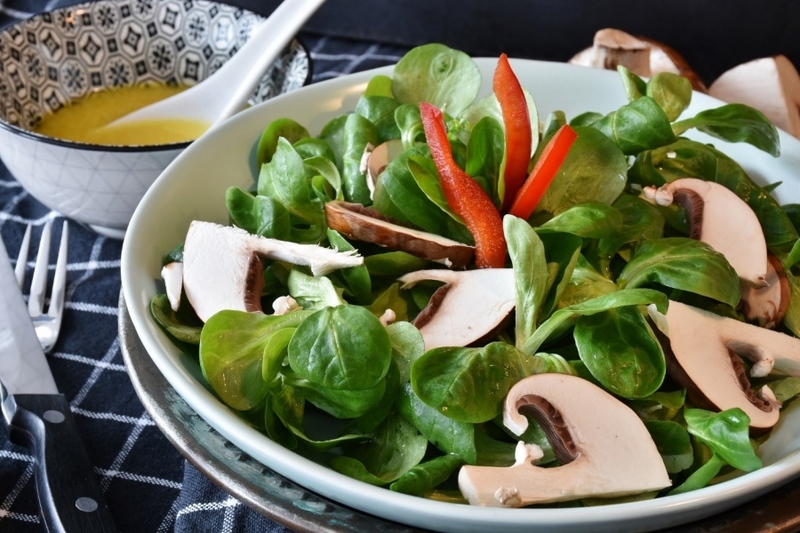 You can whip up this salad for lunch by adding a layer of spinach beneath and a roll of whole grain. Cottage cheese has been known to have the lowest calories out of all the cheeses we know apart from feta. For all the cheese lovers who give up on their diet for the fear of having to part ways with their first love can have it all for a simple replacement! Cottage cheese is known to have 98 calories per 100 grams while most other cheeses are above the 200 mark. Feta and parmesan are also excellent healthy sources of protein with minimal fat content. Pair your first love with some vitamin-rich fruits and you are good to go! This is the perfect snack for your post-workout nibbles. This is the ultimate breakfast of the champions. The black beans are enriched with carbs, rich in fiber and the bell peppers add a lot of vitamin C. The best part of the breakfast is the protein-rich egg that prevents overeating. Research has proven that people who have eggs for breakfast feel fuller for the rest of the day and consume 22% lesser calories than people who have a 100% carb-rich breakfast. Are you always struggling to get some food in you every morning while you zoom through your morning routine as you worry about getting late for work? Pro tip: pre-boil some hard boiled eggs and just have one with whole wheat toast and vitamin-rich fruits on the go. It is not only enough to know whether or not you are getting the right nutrients. It is also important to know when to eat it. There are specific times of the day when our body is at its optimal capacity to absorb specific nutrients and this is where working with a nutritionist can help you. Most qualified nutritionists and medical practitioners have now incorporated telemedicine into their practice which means you can contact them using your laptop or phone. For example, during evening your body is working at its maximum to break down and absorb proteins to repair and build muscles. Also, your post-workout body has the enhanced ability to rebuild protein and glycogen. So it is important that you consume a combination of proteins and carbs as soon as you can after your exercise. To be specific, experts recommend having your meal within 45 minutes of your workout. It has been believed that delaying your carb intake by two or more hours after exercise can cause a 50% decrease in glycogen synthesis. The exception being that you have had a meal before the exercise. It is possible that the pre-workout meal is still being utilized by your body. So the bottom line would be to make sure you take your meals within 45 minutes after getting done with the workout unless you have had a pre-workout meal!